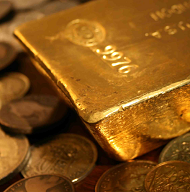 GOLD BULLION set or held near new multi-month highs against all major currencies in London trade Thursday, again nearing $1240 for US investors as the Dollar slipped amid fresh volatility in world stock markets. Asian equities fell hard once again overnight, pulling Tokyo down to 13-month lows, but Shanghai held steady after New York's S&P500 index erased the last of 2018's prior 9.4% gains at Wednesday's close. Early gains in European stock markets were then cut as the European Central Bank said it "anticipates" ending all new QE bond purchases in December as planned. 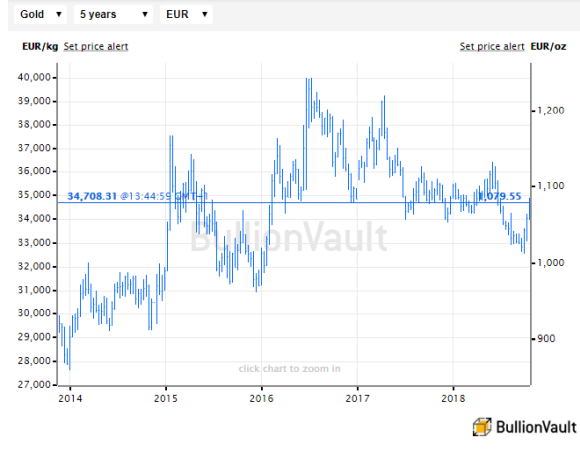 Priced in the Euro currency, gold bullion today touched €1085 per ounce, its highest since end-June, with a rise of 7.2% from late-September's 32-month low. That's the fastest 4-week rise in Euro gold prices since the UK's shock Brexit referendum result of mid-2016. 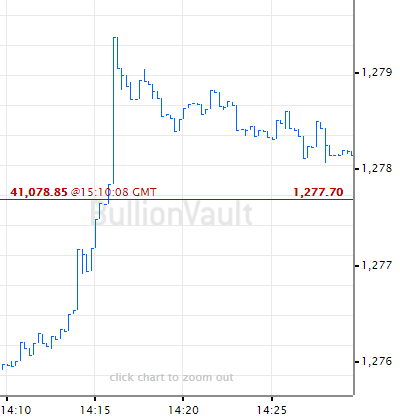 "Volatility in the US equity market, in particular the 6% drop in the S&P500 over the last 3 weeks, has helped support gold as a portfolio diversifier," says the latest weekly analysis from strategist Jonathan Butler at Japanese conglomerate Mitsubishi, also noting "evidence of significant short covering and new longs in the speculative bullion futures market. "Trade tensions between the US and China have also played a part in supporting gold [by risking] global growth. "Risk hedging in gold also has a geopolitical dimension as global tensions [rise] over the killing of a Saudi journalist. " US intelligence chief Gina Haspel, director of the CIA, yesterday listened to an audio tape – called "compelling" by Turkish sources – of Jamal Khashoggi's interrogation and murder while visiting Istanbul, the Washington Post reports. Saudi Arabia's own attorney-general today said information received from Turkey "indicates that the suspects in the incident had committed their act with a premeditated intention." The world's No.5 gold consumer nation, Turkey on Thursday left interest rates unchanged at the sudden 15-year high of 24% set in September. Ankara meantime said "the process has begun" to buy and deploy Russian-made S-400 missiles by this time in 2019, raising tensions with the United States after Turkey took offense at the way Washington offered its Nato ally only an 'off the shelf' system for air-defense in 2015. Back in Frankfurt on Thursday, the ECB confirmed it will maintain its stockpile of QE-bought assets in 2019 by re-investing all the money it receives from maturing bonds. A policy known as Operation Twist, and "frankly [something] we haven't even discussed when we are going to discuss it" according to ECB chief Mario Draghi only last month – that will see the 19-nation central bank buy around €200bn worth of bonds over the first 9 months of next year, says the Financial Times. "The ECB's authoritative leaks on Operation Twist say it wants to prevent the end of QE from turning into a new debt crisis for the weakest countries," says Italy's Il Sole 24 Ore newspaper. Italy's debt prices rallied on Thursday, edging down its cost of borrowing from this week's 4-year highs and helping shares in Milan's banking sector recover, after senior figures in Rome's left-right coalition government sought to reassure investors over its 2019 budget plans. Italy's financial problems "[have] added to the greenback's relative strength," says Butler at Mitsubishi, "which would normally be negative for USD-denominated precious metals. 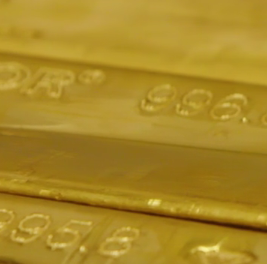 "However in this environment of risk aversion, bullion can rally despite a strong Dollar."